I’ve heard such horror stories over the last 20 years of working with teenagers! Let’s face it, raising teenagers is DIFFICULT! Maybe understanding them just a bit more, from a different point of view, will help you to reach them better right where they are at. You will be SHOCKED to read some of these answers. You will be SADDENED to read some of these answers. I hope this piece helps parents build bridges with their kids. 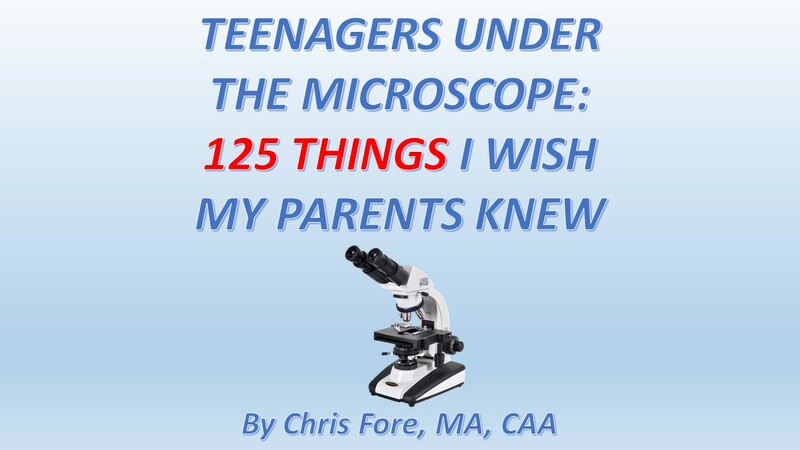 Chris Fore has worked with teenagers since 1995. Many times throughout his career in education, Fore has surveyed the student body on campus. These surveys are completely anonymous. He then shares the results of the surveys with the parents on campus in a seminar he calls TEENAGERS 101. This PDF booklet comes to you directly in an emailed receipt immediately after payment. Read it on any device!